When it comes to lodging, there’s a lot to be said for choosing a familiar name. Especially if that name is “Hampton Inn”. 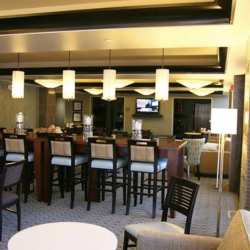 A well-known national hotel brand, Hampton Inn has earned a reputation for exemplary service and gracious accommodations. No wonder it’s so popular with leisure and business travelers to Traverse City. 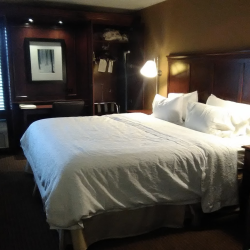 Located right on US-31 North, just minutes from downtown, the hotel offers 124 well-kept guest rooms, several of which are handicap-accessible. Hampton Inn offers several thoughtful amenities, including a large, indoor swimming pool, full fitness center, a complimentary hot breakfast and—for the corporate traveler on the go—a business center fully equipped with printing and copying services. Hampton Inn is across from the Traverse City State Park Beach, which offers hundreds of yards of unbroken, pristine beachfront, perfect for picnics, swimming, beach combing, or simply soaking up the sun. 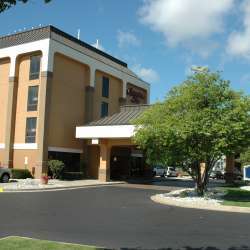 Being on the main avenue in town, the hotel is also conveniently located near many of the area’s attractions. Wineries on both the Leelanau and Old Mission Peninsulas are a just short drive away, as are area golf courses, a ski resort, downtown shopping, popular restaurants, and pretty much anything you can imagine to fill your days with fun here in the North Country.